12 October 1798 – 11 Juin 1801: His Highness The Most Serene Infante Dom Pedro, Grand Prior o Crato. 11 Juin 1801 – 20 Mairch 1816: His Ryal Highness The Prince o Beira. 9 Januar 1817 – 10 Mairch 1826: His Ryal Highness The Prince Ryal. 12 October 1822 – 7 Aprile 1831: His Imperial Majesty The Emperor. 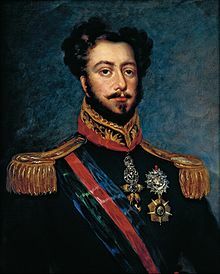 15 Juin 1831 – 24 September 1834: His Imperial Majesty The Duke o Braganza. This page wis last eeditit on 14 Apryle 2019, at 16:26.